THE ROAD TO KHALISTAN: WHEN IS A KIRPAN NOT A KIRPAN? WHEN IS A KIRPAN NOT A KIRPAN? My heart is broken - again. 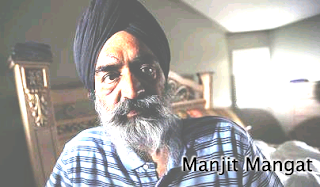 What happened in Brampton/Toronto over the weekend, however, has compelled me to come forward. was in hospital with stab wounds to the abdomen, thighs and legs and a cut caused by a kara on his face. There are some pictures at the first link, along with the story. But, wait! There is something very wrong here. No one was attacked with a kirpan and no one ever will be. In the very instance that a kirpan is used as an aggressive weapon, it ceases to be a kirpan, an article of faith; it is merely a knife or a dagger or a sword. And the person who wields it ceases to be a Gursikh and becomes a common criminal, a thug. These thugs must be treated as the criminals that they are. I realise that this is a distinction that will be lost on the general public, but it must be made here, among us Sikhs. I also realise I am leaving myself open to attack for bluntly stating this, but it is the truth and, I am certain, the opinion of the vast majority of Sikhs who are good, peaceable, law-biding citizens of the respective countries. There are much better ways of resolving our differences, however compelling those differences may be they may be, than stabbing each other with what should be an article of faith. How many times have we argued that a kirpan is a sacred Article of Faith, never to be used for any purpose aside from defence. Today, that argument seems a bit hollow. Please read the article at the last link above; pay extra attention to the comments (356 as I write) to see how the nonSikh Canadians are responding. On the whole, I get the impression that they don't much like us. I am neither saying nor implying that a kirpan can never be used as a weapon. I have used mine when there was no other alternative to cut the throat of a member of a mob killing Sikhs during the Delhi Pogrom 1984. I drew my kirpan recently when there was no alternative in the parking lot of our local WalMart when I was attacked by a career criminal drug addict trying to steal my "drugs." (In fact, there was nothing that he could possibly have enjoyed among my medicines, but he didn't know that.) I held him until the police came without injuring him. Both of these incidents are recorded in this blog. Also it cannot be overlooked that a kara was also used as an offensive weapon. 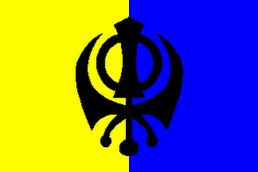 Vaheguru! Is there no end to this? Unfortunately there are some who will ever listen to the voice of reason and will have a counter argument for every argument for good sense. Better off meditating on naam then wasting precious breath time and energy on the unreasonable. I know, Bhenji, but I have a perverse love of impossible causes. Hope springs eternal and all that. I'm still aiming at that "far, unattainable sky." "In the very instance that a kirpan is used as an aggressive weapon, it ceases to be a kirpan, an article of faith; it is merely a knife or a dagger or a sword. And the person who wields it ceases to be a Gursikh and becomes a common criminal, a thug. These thugs must be treated as the criminals that they are." Those statements, coming from a Sikh, are really, really positive. I mean, people do all sorts of horrible things, and they're from various backgrounds, but it's such a mistake to ignore the masses of peace loving people from the same background and associate it with only the few who have chosen to go astray. We see this kind of mistake all the time. I believe I am giving voice to what the vast majority of Sikhs think. I know to many some of my views, especially my support of Khalistan, are taken to be extreme. Perhaps they are, I'm not sure. I do know that many more Sikhs support this than are willing to state it publicly. And most Khalistanis are like me, peaceful people who are reasonable and very willing to talk, not foaming-at-the-mouth nuts ready to kill anyone who disagrees with us. 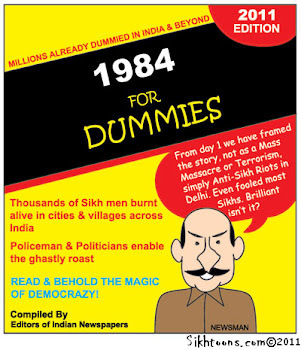 Still, the perception of us is as plane-bombering (Sikhs did not blow up that airplane!) goofballs. If it's hard for us, I can only imagine how hard it is to live with the image many live with of all Muslims being terrorist, beheading taliban types.